Raw Space, A.R.C. Gallery, Chicago. 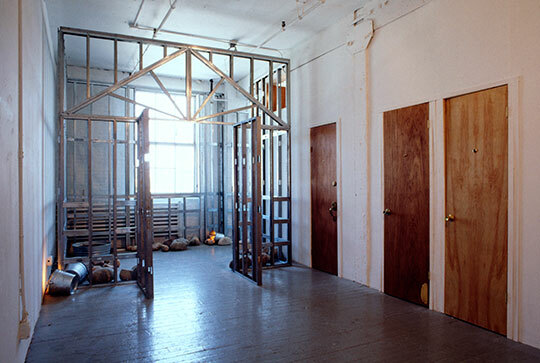 The RAW SPACE gallery was reconfigured and built out for Shelter & Shadow. The area under the columns along the east (right) wall was framed and dry-walled to create three small rooms, behind the doors. 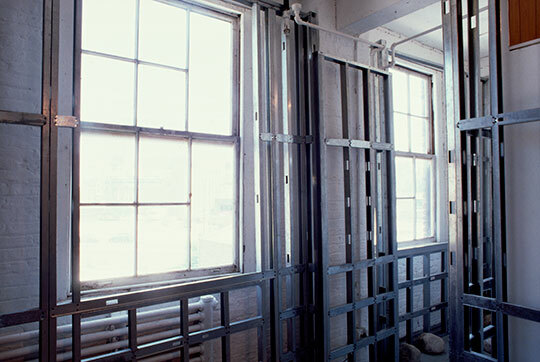 A larger fourth area was constructed with a framework of galvanized iron construction studs. 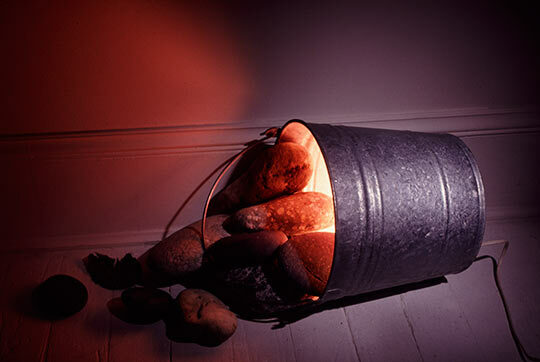 This area also contained field boulders, three galvanized iron buckets turned into lamps, a galvanized iron wash basin containing a pond pump, water and more rocks, and a bench. The open shelter structure worked in opposition to the three rooms. The four spaces together created a four-part narrative. The doors to the three small could be locked from within. 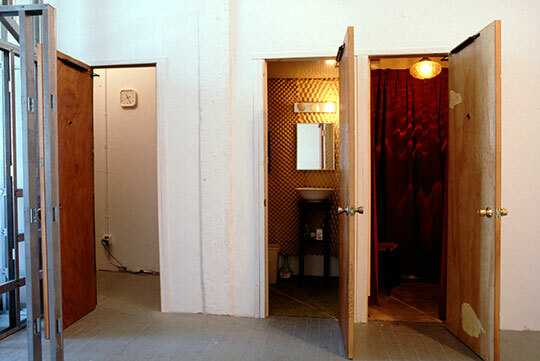 Each door contained a wide-angle peephole from which participants could look out into the rest of the space. The soundproof middle room contained evidence of misuse of drugs and alcohol. Intermittent sirens and a loudly ticking clock filled the leftmost room, which contained a broken rifle and stairs leading to an opening high in the wall. Viewers could climb the steps and monitor activities in the gallery. 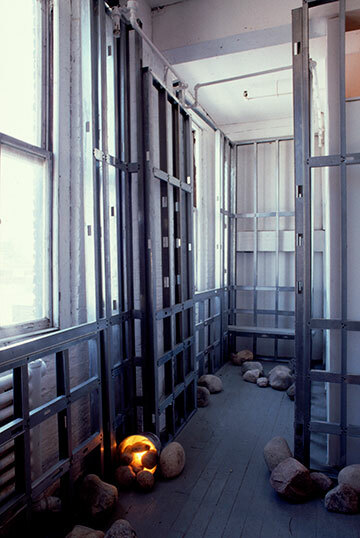 The first room — Dimensions: 10' ceiling, 4' deep, 6' wide. 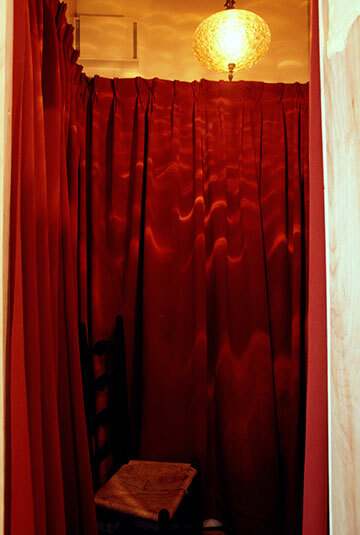 This carpeted room included a 4'x4' area encircled with red drapes and an opening to a 2' x4' closet. The curtained area had a straight chair and a hanging lamp overhead. The chair faced the closet. The viewer could see women's clothes and could hear a looped 25-minute tape of a woman sobbing uncontrollably and brokenheartedly. The second room — Dimensions: 7' ceiling, 4' wide, 4' deep. 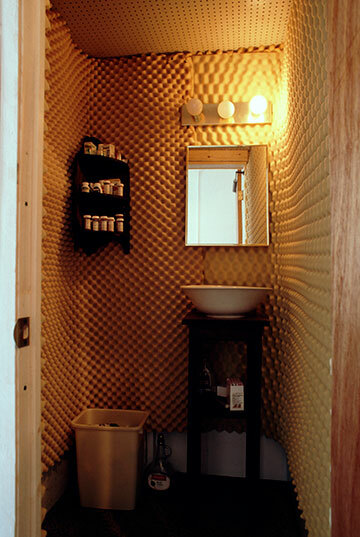 The floor was carpeted, the ceiling was of acoustical tile, and the walls were lined with sheets of egg-crate foam rubber. 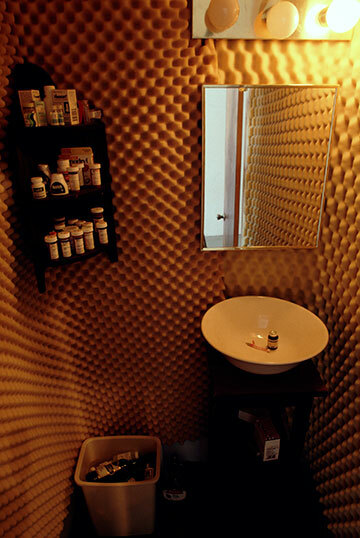 The room contained a stand with a large, white porcelain bowl containing a vial and syringe; a mirror; lights above the mirror; a wall rack with three shelves full of pain killers, sleeping pills and prescription medications; and a wastebasket with empty wine and liquor bottles. Despite the soundproofing, the crying from the first room is still somewhat audible. The third room — Dimensions: 11' ceiling, 7' wide, 4' deep. 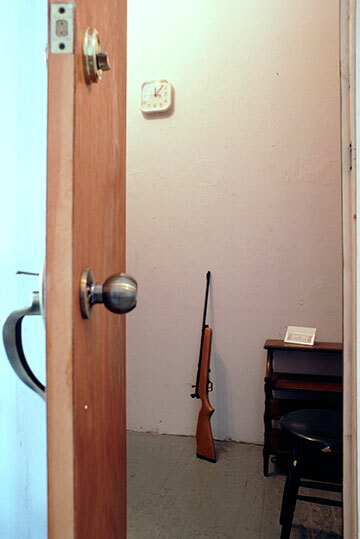 The room contained a table, stool, calendar, rifle, and clock. On the table, not visible in the slide, was a boombox playing a loop tape of sirens wailing. It was not immediately clear that the sirens were coming from the tape recorder. The sounds could have been coming from the open window of the gallery. 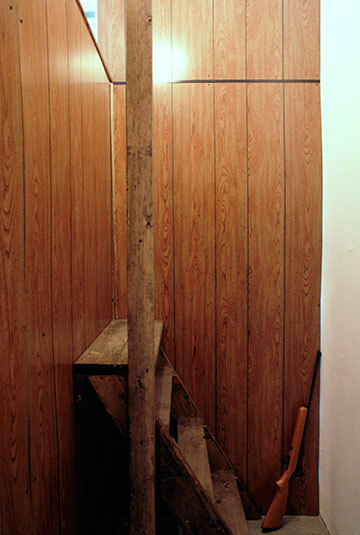 The viewer could climb a set of steps in the room and look out from a high opening to monitor activities in the gallery, watching people enter and leave. However, the viewer exposed him or herself to view up there as well when looking out. 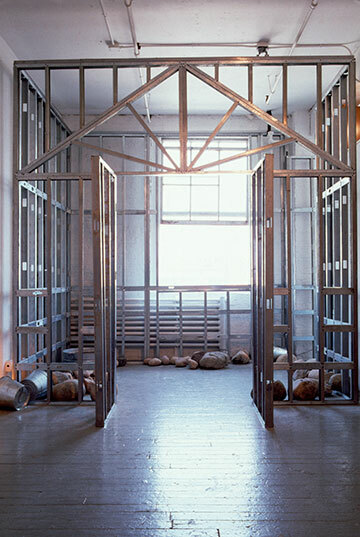 The fourth area, the open "shelter" — suggested an expansion of consciousness, as opposed to the narrowing experience of the three small rooms. 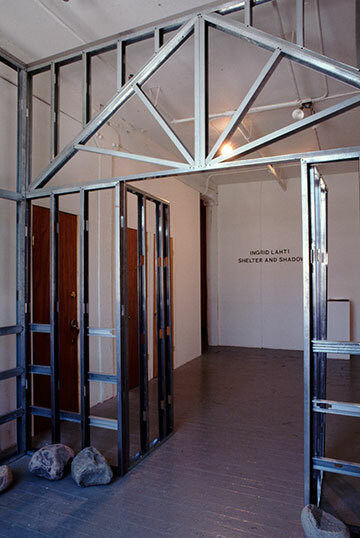 This space included the two windows on the north wall of the gallery. Three lamps made of buckets sat on their sides on the floor.